An Alaska Company Losing The Obesity Game Calls In Health Coaches : Shots - Health News Health coaches, part of the newly emerging field of wellness, provide an extra push when patients need help kicking unhealthy habits. In recent years, rising health care costs for obesity-related diseases such as Type 2 diabetes have made health coaches a popular medical resource. 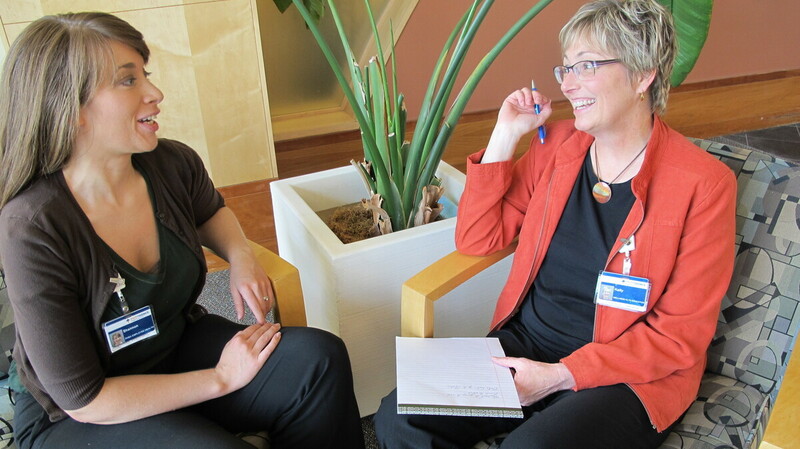 Shannon Orley, left, meets with her health coach, Kelly Heithold, right, at Providence Alaska Medical Center. Every morning, Shannon Orley parks as far away as possible from her office in Anchorage, Alaska. And on the sprawling Providence Alaska Medical Center campus that is really far away. "Right around 1,000 steps each way. Definitely worth it," Orley says. Two years ago, Orley was obese. And she faced a dilemma. She had just taken a job helping coordinate Providence's employee wellness program. But her own wellness was far off track. She drank the equivalent of six sodas a day, loved fast food and didn't exercise much. So she decided to take advantage of one of the hospital's new benefits – health coaching. Health coaches are a new kind of health professional, and it's their job to help people make those easy-to-say, hard-to-do behavioral changes that promote good health — getting enough exercise, eating a balanced diet, and managing stress. "We started out where my goal was to take the stairs instead of the elevator once a day. Not even more than that but just really manageable," she said. Soon Orley was drinking more water and less soda. She began walking regularly and attending Pilates classes. She kicked her fast food habit. She lost 50 pounds. Last year, 300 of Providence's 2,800 employees in Anchorage tried health coaching. Orley's coach, Kelly Heithold, says her clients have finally made the decision to change. "When they actually make that step and make an appointment with me, they're ready," Heithold said. "And they say, 'Help me. I know what I need to do, I just don't know how to get there.'" Health coaches are still rare in the medical profession. But they are becoming more popular as chronic and often preventable diseases like Type 2 diabetes consume more and more health care dollars. Tammy Green heads up Providence's extensive employee wellness program. She thinks coaches are an important piece of the health care puzzle that's been missing. "Everybody wants to be healthy," Green says. "We just have not been able to help them achieve those goals with our traditional approach." "Something's happening and you can pretty much assure yourself that if we hadn't been doing anything, we certainly wouldn't be seeing those trends," Green says. Margaret Moore agrees that health coaches are a good investment. Moore founded Wellcoaches Corporation in 2000, a Massachusetts-based company that has trained most of the country's 6,000 health coaches. "There's a reasonable army now of health professionals that have become coaches in this last ten years," Moore said. She expects the profession to grow steadily. Especially now that Medicare has started paying for up to 20 obesity counseling sessions a year. But Moore acknowledges there's debate in the medical field over whether health coaching should be a separate profession or just a new skill set for existing providers. She thinks there's room for both. Back at Providence, Shannon Orley has reached an intersection on her walk to work. And like a former smoker trying to resist a nicotine urge, she has an important choice to make: the elevator or the stairs. "You know every time I go to reach for the elevator button there's a little voice in the back of my head asking me, 'Really, is this going to make you feel better? Is this part of your goal? Is this where you're headed?" she said. With her coach's help, healthful choices have started to feel better and better. This story is part of a reporting partnership that includes APRN, NPR and Kaiser Health News.